Those who follow the Tigchandler blog will know of my passion for this noble grape – gewürztraminer. This is how the Tig blog was born, reviewing New Zealand’s Brookfields and Coopers Creek gewürztraminers. New Zealand continues to excite with stunning examples of this varietal – but it came originally from Alsace in north-east France. One of the most famous Alsatian wineries supplying gewürztraminer to the world is Hugel. I may be a tad biased as I visited Hugel in 2006 and spent the day being hosted by David Ling, originally from the south-west of England like myself. Arriving at the Hugel winery in Riquewihr was like walking through a Hans Christian Anderson story book, as I felt like the Hansel and Gretel children coming across the gingerbread house. I was in awe! Some photos are shown below in a slideshow – up and down and around winding cobbled streets the buildings are stunning, mesmerising, wonky, colourful, delicious! Many of the buildings date back to the 15th and 16th centuries, built by winegrowers who at that time were wealthy and successful. 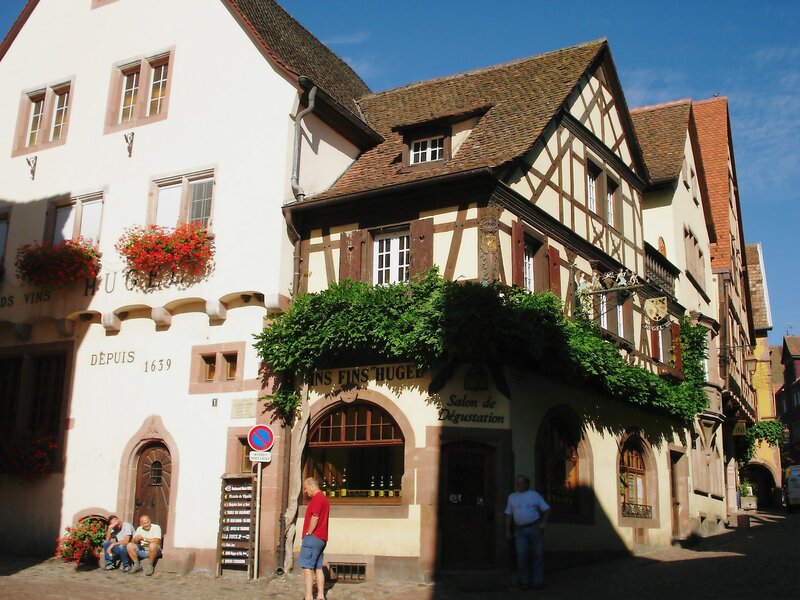 While Alsace has been a grape-growing region for over 2,000 years, the history is surprising and shocking, bearing in mind the reputation, individuality and respect that the region has today. From the extremely prosperous years, particularly in the 15th and 16th centuries, a series of major events almost wiped out the winegrowing industry altogether. A key event was the Thirty Years War (1618-1648) which killed 90% of the population of Alsace, through fighting, famine and disease. According to Hugel’s brochures, “the population of Riquewihr was 2,245 in 1610 but only 74 in 1636”. Furthermore, the Rhine, which was such an important route to export markets, became a dangerous frontier between warring states. A third blow to the wine industry was the arrival of settlers lacking the viticultural knowledge of the old Alsatians. Thus followed three centuries of decline. “After the First World War, in 1918, Alsace wines no longer existed.” Furthermore, with the tough and uncertain economic times resulting from changes between German and French rule of the region, many winemakers had to take second jobs. The Hugels became coopers. Thereafter, the turnaround began! The passion of winegrowers in the area was manifested in concentrating on the key varieties suited to the region, as well as steadily improving the methods of cultivation and vinification. The grapes accounting for about 85% of the vineyard area in Alsace are now: pinot blanc, pinot gris, pinot noir, riesling, gewürztraminer and muscat. Alsace is the driest wine-producing region in France. It is quite far removed from maritime influences and protected by the Vosges mountains. The cool climate is ideal for the aromatic varieties to ripen slowly with full and intense flavour. The soil types in the Alsace region vary widely, and winegrowers have used their centuries of experience to match the grape types to the soils. This brings to mind the diversity of soil types in the McLaren Vale region of South Australia, where work is ongoing relating soil types to wine grapes. The Hugel winemaking tradition started in 1639. Hans Ulrich Hugel settled in Riquewihr in 1639 during the devastating period of the Thirty Years War. In 1639 he was made a freeman of the city and he became the head of the Corporation of Winegrowers. He was the first of 12 generations of winegrowers in Alsace. After World War I, following the industry’s stark decline, Frédéric Emile Hugel, worked to save the vineyards of Alsace from disease and neglect, devoted to the production of high-quality wines from noble grape varieties, and his son Jean continued in this vein. More recently, the Hugel family was instrumental in producing legislation to protect the Vendange Tardive and Sélection de Grains Nobles. The Hugel winery today is deservedly a global phenomenon, exporting the majority of its wines, to more than 100 countries. The Hugel family vineyard consists of 25 hectares in Riquewihr, which is hand-picked, with deliberately low yields and no use of fertiliser. The family buys grapes from growers from another 100 hectares in Alsace, also all hand-picked. After bottling, the wines are cellared for at least two years on average. The Hugel cellars are mostly located beneath the old buildings of Riquewihr. On my tour of the cellar in Riquewihr, David points out a sign over the door that looks like it says 1898 but the strange looking 8 is in fact a 4 – 1494! The history of this place envelopes you with its richness and romance at every turn (I refer you again to the slideshow!). There are several oak barrels over a century old, and David also shows me the oldest barrel in continuous use in the world, from 1715, known as Ste Catérine. The certificate for the Guinness Book of Records, signed in 1990 by Norris McWhirter, sits proudly by the enormous barrel. So to the Hugel gewürztraminer! One key Hugel belief is that: ‘The wine is already in the grape’. If ever you have the chance to taste grapes off the vine, the most delicious by far are those of gewürztraminer. They give such seductive flavours and aromatics of spice, rose petal, honeysuckle, even a speck of ginger… Made into the most glorious wines of the heavens, add in an oiliness, a golden hue and a lingering, dry finish. 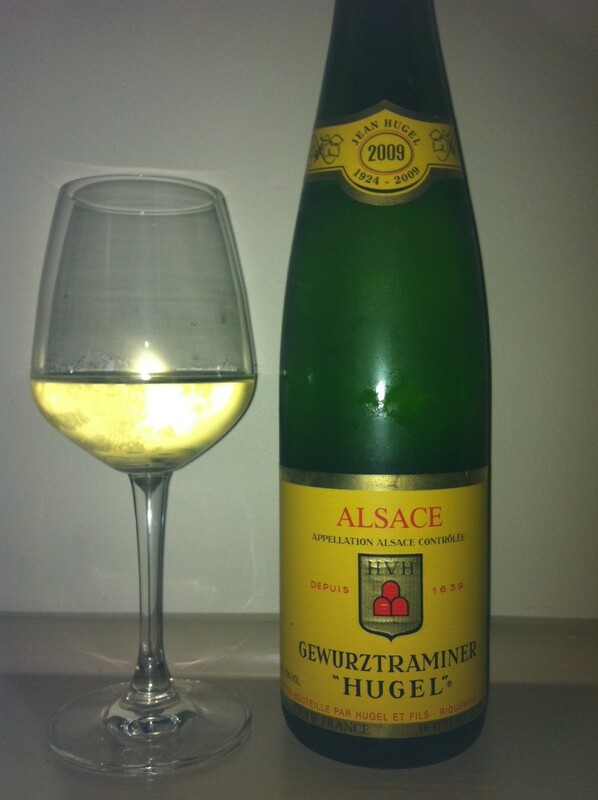 Suave and spicy is the description on the label of the 2009 (current vintage) Hugel Classic Gewürztraminer (pictured) – you bet! Great food matches are spicy foods, like Thai or other Oriental dishes, and maybe smoked fish or meats. For me, the wine is heaven in a glass and I need no more food than that! This entry was posted in European wine, Gewurztraminer, NZ wine, Old World Wine, Wine varietals and blends and tagged Alsace, gewurztraminer, Hugel. Bookmark the permalink. I am a small wine producer on the Granite Belt and make a Gewurztraminer from grapes purchased from Northern NSW near Glen Innes. I have 2 vintages an 09 and 10 that I would like to send you.